Our late Spring Exhibition at Low Fell Library commenced on Monday 8th April and will continue until the end of May. The paintings below are a selection of those on show. 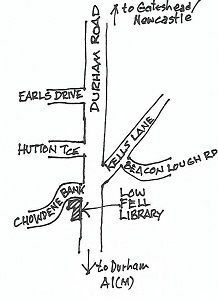 Low Fell Library is located at the traffic lights at the southern end of Durham Road, Low Fell. Gateshead. Summertime by Jenny Dyson -acrylic & oil. Old Sunderland Bridge, Durham by Willie Drea. -oil on canvas board 12"x10"